Never bring your laptop to a meeting again. 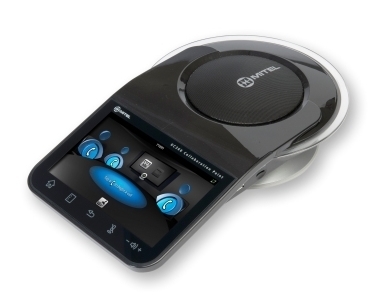 Introducing the Mitel UC360. Concerning multi-party collaboration, clients come to BCS looking for a solution that is affordable and simple to use while still providing all of the high-tech capabilities of a dedicated multimedia business communication suite. Some might think that sounds like a tall order, but thanks to Mitel’s UC360 Collaboration Point, we’re happy to say that they are wrong. UC360 is ideal for those offices and shared spaces that wouldn’t usually be used for intensive multimedia collaboration and those businesses that want more than what even the most expensive business phones offer in the way of collaboration. Intuitive touchscreen and user interface. The vibrant 7-inch color display takes the guesswork out of device deployment and operation. It serves as the hub of all of your activity and makes it so you don’t even need to bring your laptop into the meeting with you, no matter how intensive your presentation. Superior audio and display quality. Whether you have two or four parties participating in your meeting, UC360 boasts high definition audio that will provide each member of the conference with an in-room experience no matter where they are. And UC360 supports HD display on LCD monitors and top-of-the-line projectors so every crisp detail of your presentation will have the utmost clarity. Easy access to everything you need. Pull up all the important documents you need for your presentation however is most convenient for you. UC360 supports USB flash drives and micro SD cards as well as instantaneous access to Dropbox and Google® Docs™. You can even connect to a remote desktop. Again, no laptop necessary. In short, if your business already uses Mitel Unified Communications technology, Mitel UC360 is the perfect addition to your office. And even if you don’t, UC360 will complement your existing infrastructure and streamline productive collaboration without putting extra strain on your IT department. As an exclusive Mitel business partner, BCS is proud to offer your company UC360 and the rest of Mitel’s cutting edge business communication solutions. Call or contact us today to learn more. The Beauty of IT Outsourcing: We’re the IT Department That Never Takes a Vacation.